Los Angeles, California's Strife are gearing up for the release of their new album, "Witness A Rebirth," which is being released by 6131 Records in North America on November 6th. The full length is the band's first offering in 11 years and features 4/5 of the line-up from their classic "In This Defiance" album released in 1997. 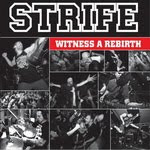 STRIFE also recruited long-time friend and founding member of Sepultura Iggor Cavalera to record drums for "Witness A Rebirth," with Nick Jett (Terror, Rotting Out, Backtrack) handling production and Matt Hyde (Slayer, Hatebreed) mastering the release. Leading up to the release date, Strife have released episodic "making of" videos from their time recording "Witness A Rebirth," the latest available via YouTube here. The first installment can still be seen via YouTube here.